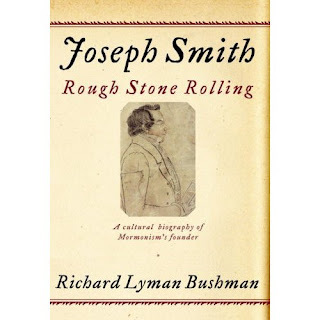 I finally finished Joseph Smith, Rough Stone Rolling: A Cultural Biography of Mormonism's Founder by Richard Lyman Bushman, which I read for both the Unread Authors Challenge and the Triple 8 Challenge (and because I was really interested in the subject, of course). It took me about a month to get through it, not because it was boring, but because it is (very densely) packed with information. It required more of me than most things I read, so I wanted to give it the attention it deserved. Basically, the book is a biography of Joseph Smith, the founder of The Church of Jesus Christ of Latter-Day Saints (a.k.a. the Mormons), but it's not a traditional recap. Bushman labeled it a "cultural biography," which seems to mean it's an examination of a people/culture instead of just one member. While the book begins with Joseph's birth and ends with his death, it's really not as much about him as it is about the church he created. In a nutshell, Joseph was a boy who felt troubled about religion. He really didn't believe in any of the churches prominent in his day. Confused, he turned to the Holy Bible for answers, where he found a scripture in James which exhorted him to ask God for answers. When he prayed, Joseph said he saw a vision of God the Father and Jesus Christ in which he was told to join no church. He was told he would be given more instruction concerning God's wishes for him, and he was. Through visions and revelations, he was commanded to start a church, which he did. Because he claimed he had spoken with God, Joseph was ridiculed. Yet, people were attracted to Mormon theology and soon Joseph had a large following. He was a man of the people, loved and revered by the Saints (as the Mormons called themselves) as a prophet of God. Outsiders, however, considered him a charlatan, and continually sought the destruction of him and his people. Still, he soldiered on, receiving revelations, publishing scripture (predominantly The Book of Mormon), building cities and temples, leading his people, even running for President of The United States. A controversial figure always, he was martyred in 1844, after which the presidency of the church went to Brigham Young. Today, The Church of Jesus Christ of Latter-Day Saints is a thriving church known worldwide. In retracing Joseph's steps, Bushman uses a plethora of sources from interviews to journals to newspaper accounts to original church documents. The amount of information he presents is staggering (the book is 561 pages long, with 177 pages of appendices and indexes). He analyzes Joseph's actions, revelations and policies in great depth. I've been a member of the Church for 32 years, and I've never read a history as complete as this one. Plenty of the information was new to me. Richard Lyman Bushman is an active member of The Church of Jesus Christ of Latter-Day Saints. He acknowledges that, as such, "pure objectivity is impossible" (xviii). However, I think he did an admirable job of presenting every side of Joseph Smith. He didn't shy away from situations which showed the prophet in an unflattering light, or ignore criticisms from Joseph's contemporaries. He presented the facts and, in effect, said, "Choose for yourself." I expected Rough Stone Rolling to be a straight biography of Joseph Smith, and it wasn't. I would have liked more information about his personal life, family history and private thoughts. Obviously, there are other biographies out there (including one by Joseph's mother) that contain this information, but I wanted a little more from Bushman himself. All in all, it was a thoroughly insteresting study that I, personally, found fascinating. Will it appeal to a non-LDS reader? I don't know. Some people's highest praise of a biography/memoir is that it "reads like a novel." This one doesn't. It's not a book that will keep you on the edge of your seat, but it is a fascinating, thoroughly researched biography of a man who lived and died in the service of his God. The man who was so reviled in his time left an incredible legacy - one to which Richard Lyman Bushman does great honor in Rough Stone Rolling.